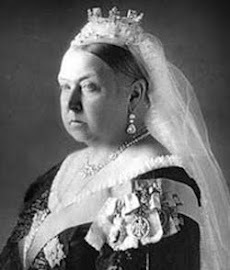 Not all modern incarnations of Queen Victoria are executed in stone (see previous posts of 2 March and 12 March). Here are a few fashioned of softer material. Madame Tussaud's Wax Museum, London: Wax model maker Marie Tussaud moved to London from Paris three years before Victoria ascended the throne. Her "museum" in Baker Street, which initially focused on French figures such as Louis XVI, Marie Antoinette, Marat, and Napoleon, was an instant success, and Tussaud became one of the leading women entrepreneurs of nineteenth-century London. 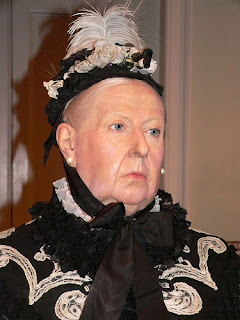 Tussaud soon added figures from British history to her display, emphasizing verisimilitude. When Queen Victoria married in 1840, for example, Tussaud obtained her permission to have the same dressmaker create a replica of her wedding gown for £1,000. Brading Wax Works, Isle of Wight: In the "Great British Legends" room you'll find the queen mourning her husband in a version of the Durbar Room at Osborne House. Originally called the Isle of Wight Wax Works Museum and Animal World, this attraction located between Ryde and Sandown was founded by Graham Osborne-Smith in 1965. The queen shares the room with Titus Flavius Vespasian; Lord Louis Mountbatten; Diana, Princess of Wales; and Sir Winston Churchill. Queen Victoria Building, Sydney: The Queen Victoria Building has been described as "the most beautiful shopping center in the world." Built in 1898 to replace the original Sydney Markets, it occupies an entire city block. In 1984 it was completely refurbished as a shopping center. A hanging clock displays a series of mechanically moving tableaux of British kings and queens every hour on the hour. This "exhibition" is heralded by loud trumpeters and ends with the beheading of Charles I. Permanent and temporary exhibitions are featured on each level and include this wax model of Queen Victoria and replicas of the British crown jewels. 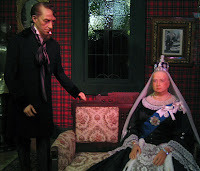 Royal London Wax Museum, Victoria, British Columbia: The queen receives Prime Minister Benjamin Disraeli in her tartan-lined drawing room. Disraeli, a Tory, was PM for nine months in 1868 and then again from 1874 to 1880. Victoria approved of Disraeli's conservatism and enjoyed his charm. 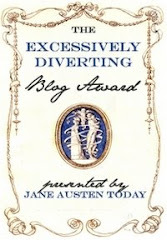 Disraeli famously noted that "everyone likes flattery, and when you come to royalty, you should lay it on with a trowel." When Disraeli died in 1881, Victoria was devastated and reportedly cried for days. Potter's Wax Museum, St. Augustine, Florida: In the heart of historic St. Augustine you can find this rendition of the queen. Founded by George L. Potter in 1949, this attraction claims to be the first wax museum in the United States. The general consensus among those reviewing it on tripadvisor.com is that it is also the lamest wax museum in the United States. Clue #1: the elasticized neckline in the queen's polyester blouse.